Every Thursday comes with a new word. And lately with waves of heat and nights petrified in silent shades. It is a real scorcher today! A scorcher = a very hot day. I like everything about the summer: the beginning of summer, the midsummer days and the dog days. dog days = the hottest days of the summer. 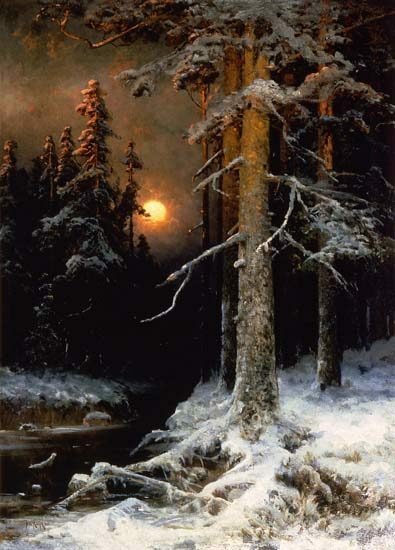 Photo: Winter’s hold by Julius von Klever. ‹ Gramatica:”I-ati” sau “Ia-ti” ? Thanks for the new word. I’ll try to use it. Especially these days 🙂 when the Bucharest is so hot. Tomorrow is also supposed to be a scorcher ! My pleasure & welcome to my blog:). I like the dog days, as I cannot help but comparing them with the frosty winter. I read this on a frosty morning.